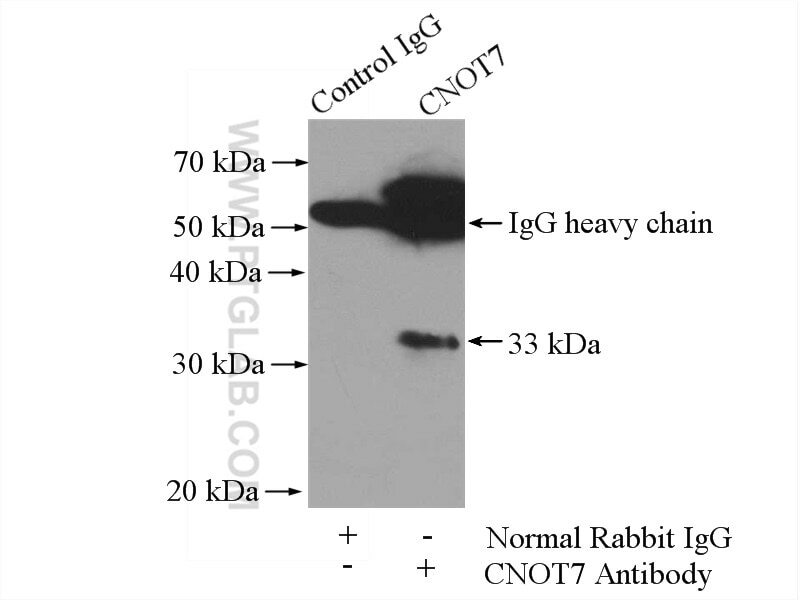 IP Result of anti-CNOT7 (IP:14102-1-AP, 4ug; Detection:14102-1-AP 1:300) with mouse testis tissue lysate 4800ug. Cnot7, Ccr4-Not complex 7, is a component of CCR4-NOT complex and known to be a transcription factor and a modulator of mRNA degradation in yeast. Mammalian Cnot7 interacts with Tob and its family members, which is known as an inhibitor of BMP signaling through interfering with the Smad system and is involved in bone metabolism [PMID:17451368]. It is one of at least 8 subunits that make up the CCR4-Not transcription complex, which is involved in negative regulation of the pol II directed transcription in yeast24 and may be involved in global gene regulation by modulation of TATAA-binding protein (TBP) activity [PMID:10880468]. B cell translocation gene 1 reduces the biological outcome of kidney cancer through induction of cell proliferation, cell cycle arrest, cell apoptosis and cell metastasis. DND1 maintains germline stem cells via recruitment of the CCR4-NOT complex to target mRNAs.